I want people to know all about the ups and downs before it happens to them. Because Fitness Training is “personal”, I can guide my clients to maximize results and minimize frustrations. Q. What is a Fitness Trainer and what do they do? A. At Health Matters Fitness, we believe that a Fitness Trainer should be, at the least, educated and certified through a reputable fitness organization. While we can’t speak to other Fitness Trainer’s procedures… WE WILL assess your fitness level, set up a personalized fitness program, guide and motivate you to reach your peak fitness potential. Our job is not to just show people how to properly use fitness equipment – but to utilize our skills, education, and experience to help you achieve the desired level of fitness that is appropriate for your body. 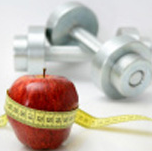 We provide you with education about strength training, cardio and basic nutrition and focus ON YOU during your training. Beyond giving you a reason to “show up” to your workouts… we hold you accountable to the goals you set – we will track your progress, support you, encourage you and celebrate your victories! Q. What should I expect in the first session? A. The first meeting is about 60 minutes. It is devoted to assessing your fitness level, recording body measurements so we can track your progress, reviewing your exercise and health history and discussing your fitness goals. We use this extra time in your first session to listen closely to what you say and use all the information gathered to create your personalized fitness program. At Health Matters Fitness, we want to be sure you feel comfortable with your Fitness Trainer – that you can speak freely and ask questions – we want to make sure we understand your fitness goals so your program – created for your body type and fitness level – will maximize each exercise so you achieve those goals! make sure you discuss your desire to partake in physical fitness activities with your doctor prior to scheduling an initial session. so you still get maximum results. Q. What if I don’t know how to do an exercise? A. That’s why we’re here! We ensure you are doing a movement correctly by providing you with instant feedback on how to adjust your posture, motion, and exertion to prevent injury but still get maximum results. Q. What if I just can’t do an exercise or I don’t find it challenging? A. If an exercise is proving to be too advanced for you to do correctly we will instantly adjust it for you. Likewise, we will push you slightly past your comfort level by adding a bit more difficulty to the exercise if you find it is too easy for you. These ongoing adjustments is what keeps your workouts fresh and fun – we introduce you to different equipment while working the same muscle groups – this way you won’t get stuck in a rut! Q. What about subsequent sessions? Cool Down and Stretching: We leave this up to you to do on your own time. We maximize your sessions in the 30 minutes that we have with you. Many fitness programs exist that can help you reach your workout goals. what you need out of your resistance training specific to your body type, fitness level, and desired goals. Initial Consultation: Please CONTACT US for pricing.